Comprehensive and international in content, Dietary anticarcinogens and antimutagens: Chemical and biological aspects includes topics as diverse as the health benefits of tea, wine and beer, through the prevention of various cancers, to the development of effective communication for healthy eating. The book is organised in to sections covering: epidemiology of diet and cancer; mechanisms of DNA damage and repair; the body’s various protective mechanisms; and experimental approaches to the study of diet and cancer, with particular emphasis on humans as subjects. 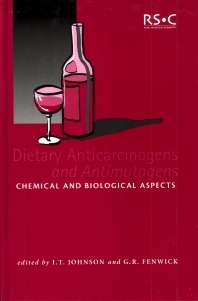 Anticarcinogens and mutagens in the human diet: Epidemiology; Bioavailability of dietary anticarcinogens and mutagens; DNA damage and repair; Defence systems: Enzyme induction; Defence systems: Antioxidant mechanisms; Defence systems: Cellular differentiation and apoptosis; Anticarcinogen effects of human diets: Animal models; Anticarcinogenic effects of human diets: Studies in man.